Not being an enthusiast of fairytale wedding scenarios, I swore up and down that I would pay no attention whatsoever to the impending marriage of Wills and Kate. But alas, I find myself drawn into the hoopla. Perhaps it’s inevitable for someone who, once upon a time, roused herself in the wee hours of the morning to watch the wedding of Charles and Di, and who sees these nuptials as a natural denouement to that fractured fairytale. So for this Three Cubed episode, I pulled out my edition of Great British Cooking: A Well-Kept Secret. The title alone was so hilarious that I had to pick this one up at the local church book fair. (If anyone knows of great British cooking, they are indeed keeping it a secret.) But the cookbook includes some lovely recipes for quintessentially British puddings, and goodies for tea and high tea. 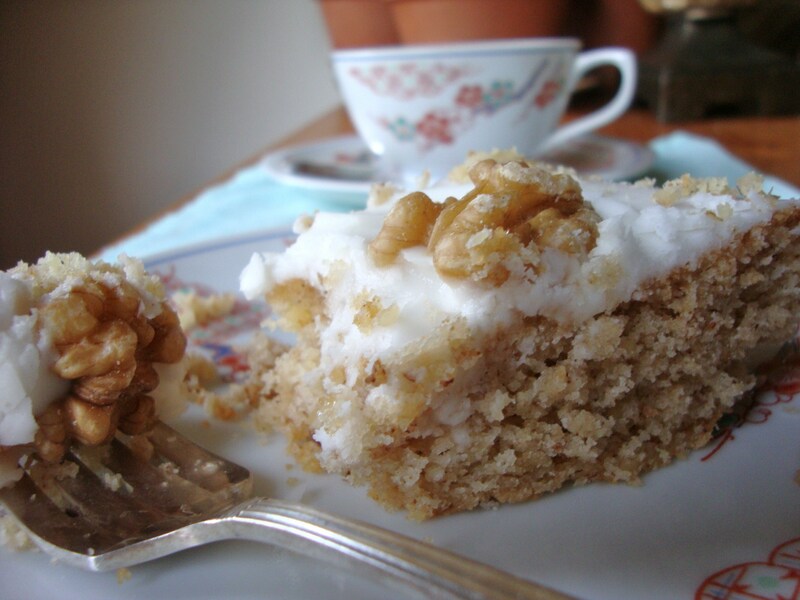 Page 227 lands us on a recipe for Old-Fashioned Walnut Cake, based on a recipe from the long-gone Fuller’s Tea Rooms. The simple cake has a white icing that sets up hard, for a crunchy topping. As it turns out, Fuller’s Walnut Cake is a legendary recipe that causes people to swoon, wax nostalgic and go to great lengths to search out the truest variations they can. A little Internet research finds many pleading for their Fuller’s fix, like the long-time Brooklynites who dream of recreating Ebinger’s Blackout Cake. Even found this ode to the walnut cake, and a mention of it in Brideshead Revisted. The original Fuller’s was apparently a layer cake, while this recipe makes a single layer. It would be nice as a layer cake, or I’d at least follow the recipe’s suggestion to use a 7-inch cake pan. Not the usual size, but it would make a higher, prettier cake. Crunchy frosting? Must have the recipe! I think a cake like that and a Laura Ashley dress would make me more of a lady. And maybe Stephen would come to tea and enjoy it as well. The cake is also mentioned in Angela Carter’s wonderful novel _Wise Children_.